Well it's Memorial Day weekend, and that means its the unofficial start of summer (f*** you, summer solstice). That means its time for BBQing, crappy summer movies, and here in Chapel Hill, senseless murder and violence in front of elementary schools. Since Chapel Hill has the most crime, hobos, and top-siders per capita in the US, I guess this is just par for the course. But seriously, people WTF has happened to our country? If we all just had a snog or two of Peak's Summer Session Ale we'd be living in Utopia-ville by Labor Day. 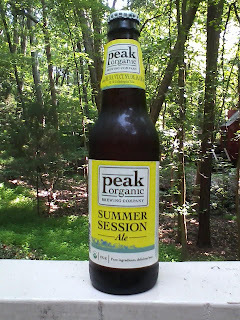 I've covered Peak Organic Brewing Company extensively on this here fine blog (use that snazzy search bar up yonder to check out past reviews), so I won't spend too much time singing their praises in this column. They rarely make a bad beer (I'm looking at you Pomegranate Wheat), and the Summer Session Ale is another fine product to come pouring out of Peak's sterling beer tubes. Peak claims that this beer is a hybrid between a west coast pale ale and a traditional summer wheat beer, and I totally buy that marketing statement. It's kind of hoppy like a pale ale with a nice citrus taste (a floral bouquet if you will), but it also has that unfiltered character of a wheat beer. It has a pretty despicable 5.0% ABV, and even I, Mr. super light-weight, was able to have 2 of these last night and nary feel a buzz. At $8.99 a six-pack, its not a steal, but it's not a deal either. The hype around this beer was pretty high, as I have been waiting for it for quite a while (~2 weeks) in order to add to my proud display of Peak six-pack boxes on top of my kitchen cupboards. Wait, what's that? I'm not in college anymore and it's not 2003? Whaddya mean I'm almost 30 years old? And what's this about I got a girl (wife) pregnant and I have a 14 month old baby to take care of? Hahaha, that's totally funny. You're such a jokester, you totally had me for a second. I'm gonna go eat a Totinos pizza, listen to Taking Back Sunday, and play NHL 94 now. Lates.